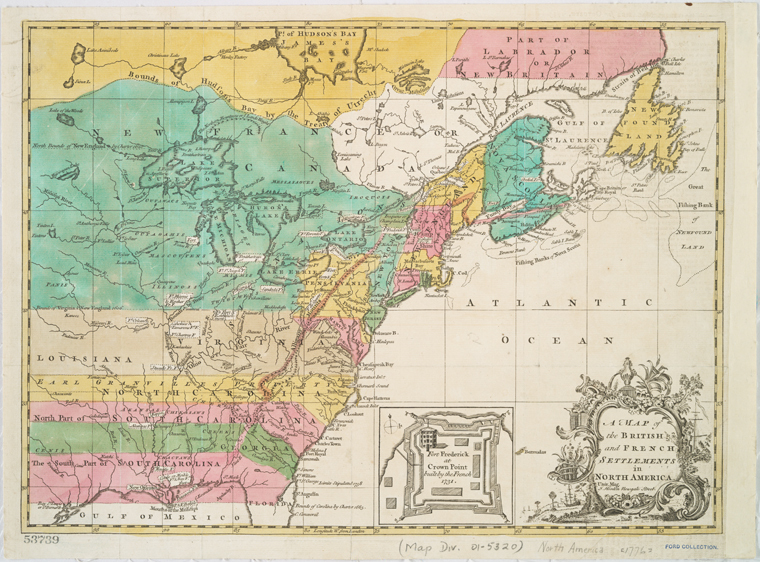 In the 17th and 18th centuries, the area of what would become the Northeastern United States and the neighboring Canadian Provinces of Ontario and Quebec were a battlefield for French, British and Native American control. With the two European empires locked in a protracted series of large and small wars around the globe, the American colonies were often a sideshow to the global conflict. In the colonies, King William’s War (1689–97), Queen Anne’s War (1702-13), King George’s War (1744–48) and the French and Indian War (1754–63) each played a role in shaping not only the birth of the United States of America but also the face of the entire globe for centuries to come. I grew up in Western New York State, spent most of my twenties in Eastern Michigan and Western Pennsylvania, and finally settled in New York City nearly twenty years ago. In my life I’ve logged many a road trip to the landmarks of British and French military control at Fort Stanwix, Fort Ticonderoga, Fort William Henry and Fort Niagara, along with various battlefields and stops at roadside markers. In July, I’ll be swinging by Fort Necessity in Pennsylvania where a British officer named George Washington first commanded troops in an opening battle of the French and Indian War. I’ll also be swinging through Letchworth State Park which was occupied by the western edges of the Iroquois Confederacy which sided with the British during the era of European conflict. In short, I’ve spent my entire life living amid the ghosts of the contested colonial regions of the North American colonial wars. 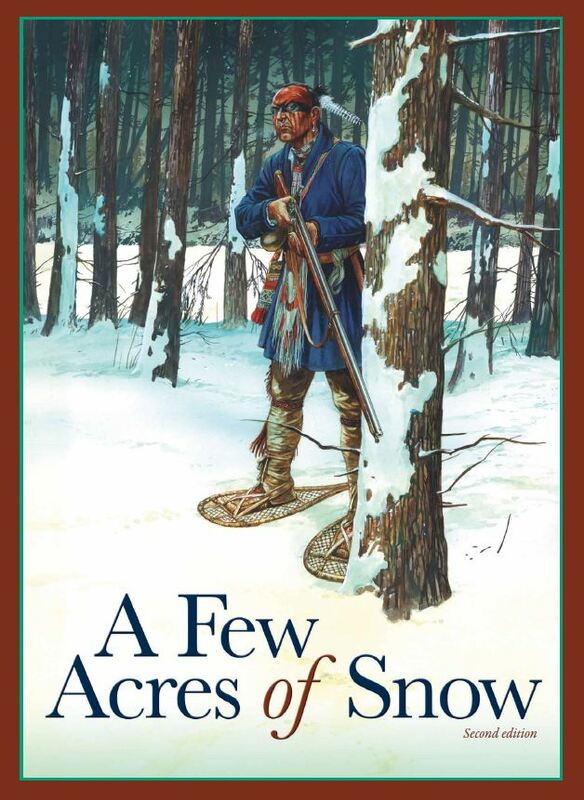 At the recent D-Day Plus 70 weekend at Metropolitan Wargamers in Brooklyn, NY I was fortunate to score a copy of A Few Acres of Snow in a dice-off raffle. 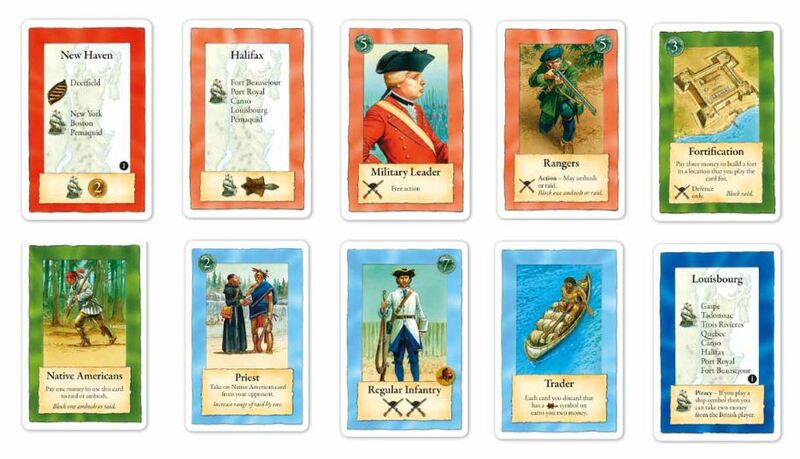 Created by famed designer Martin Wallace and released by Treefrog Games in 2011, the game takes its name from a quote from Voltaire’s Candide commenting on the absurdity of European focus on colonial wars for territory. AFAOS takes players through the French-British colonial period in North America as each nation competed for control of the continent. Within the theme, the game is a rich mix of deck-building and area control mechanics as players seek to settle and defend key areas of the map. 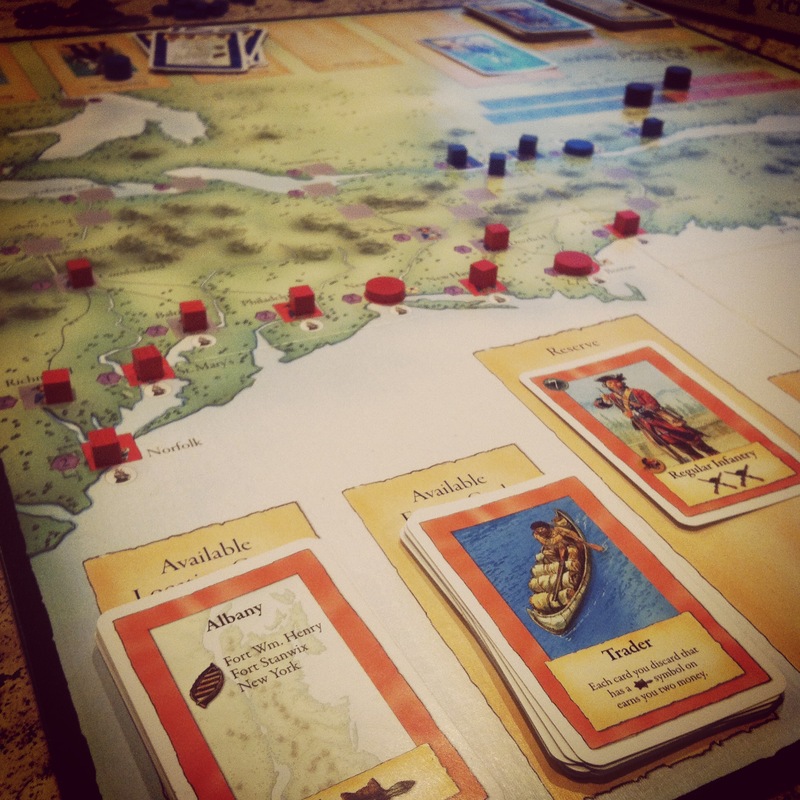 The two-player game begins with players choosing a side as the British or French with a set number of settled outposts in the wilderness of 17th and 18th century North America. British begin with their main settlements in New York and Boston while the French player starts with Quebec. Players begin with a draw deck from which they start with five cards. Playing cards in turns of two actions each, players perform a variety of actions including settlement, fortification, raids, sieges, trade, piracy and a number of card management options. Symbols depicted on each card allow for enormous flexibility in how each player executes their strategy of expansion. For example, a player might begin with a Location card setting off from an existing settlement. From there, a card is played with the appropriate movement symbol like a Bateaux along a river. Once at a new location, a card with a Settler might be played to create a new settlement. As a player’s holdings expand, their decks grow in size and options, leading to even more potential paths of empire growth. 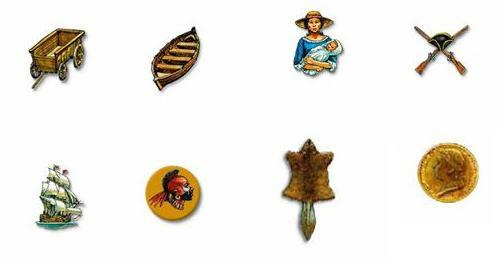 Once all settlement tokens are used or major settlements like Boston or Quebec are captured, the games ends and victory points are scored. In my first play through AFAOS, I faced off with my son playing the French and me playing as the British. The game plays in about an hour, but on our first run we went to a bit over 90 minutes as we wrapped our heads around the rules. After I quickly sailed to and settled Halifax well within the bounds of French country, several sieges commenced. In his first siege attempt, my son was repelled by my superior military might powered by my store of money. He then took a few turns to quickly trade a lot of fur (one of the strengths of the French player) to buy additional forces for a second siege which chased my British from his territory. In the meantime, I pushed inland with a string a settlements toward the Great Lakes in the hopes it would expose Quebec to a siege. However, my son quickly landed a stronghold in my coastal territory in a siege victory at Pemaquid. I retaliated with two failed attacks on Pemaquid using Native American raiding parties. Having held on, my son launched an attack on Boston and my British rule of the colonies fell. Our first game showed us how quickly AFAOS can move once you get the mechanics. Getting the right cards in and out of your hand is key to winning the game, and the cards shift in importance as the game quickly unfolds. The balance of trade, expansion and military actions does a fantastic job in re-enacting the dynamics which played out between the British, French and shifting Native American allies over some 150 years. 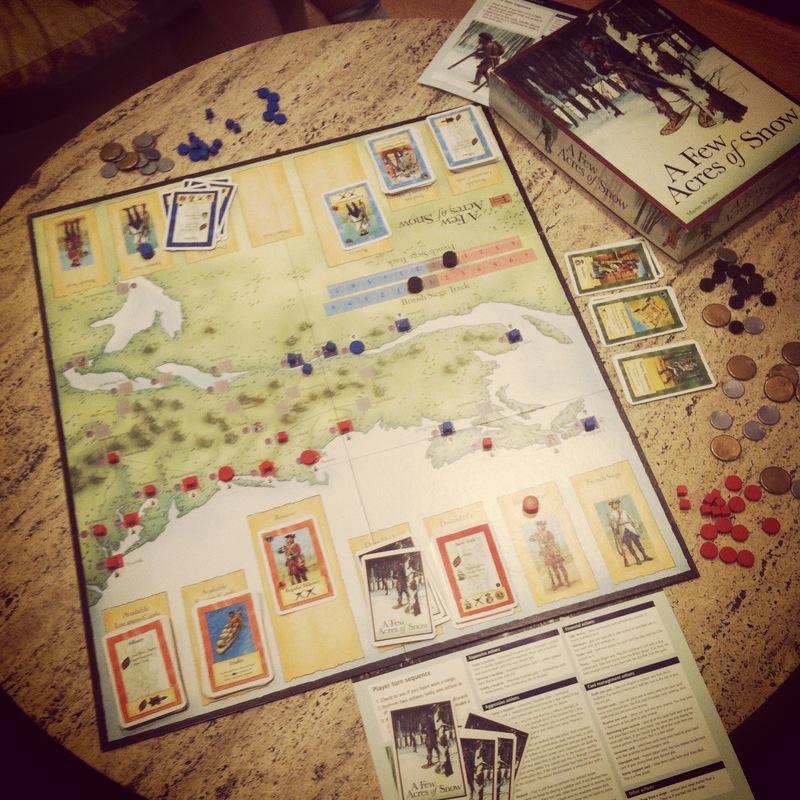 Even though we upset the course of history, we both walked away pretty thrilled over our new game and chatting up strategies for the next time we meet up in the woods and along the coasts of Colonial America.